During the 30 million years it took to recover the loss, Earth again grew warmer. 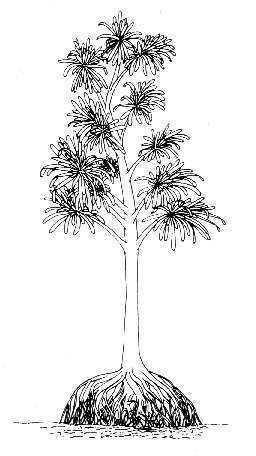 Hardy mosses and horsetails, that survived to this day, joined with evolving tree ferns, and cordaits to form the first subtropical forests. It is called the Carboniferous period because, over millions of years, succeeding generations of these extensive forests loaded themselves with carbon extracted from the atmosphere. They were gradually pressed into the ground and fossilized as coal and oil. 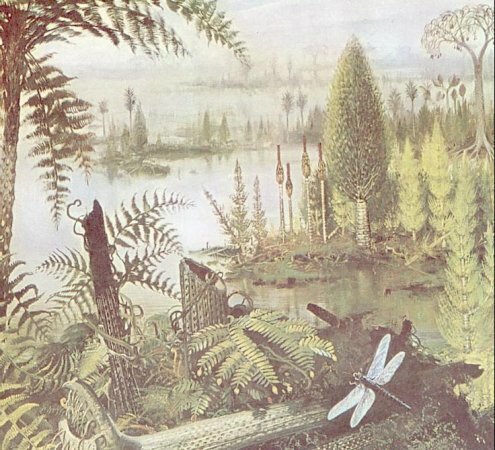 Figure 17 shows a typical Carboniferous forest beside shallow lakes swarmed with life. Living and rotting vegetation provided food for insects, spiders, crustaceans, and many other invertebrates. The illustration also shows a giant dragonfly with 28 inches wingspan. One plant in the picture looks like a Christmas tree. It is the proto-gymnosperm, which is a mixture of fern and gymnosperm features.